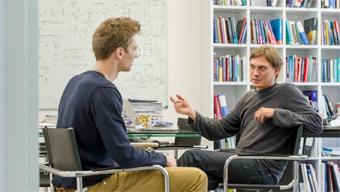 Master's students receive from the beginning of their studies advice from a mentor. It is recomendable to choose a mentor working on topics potentially interesting for a later Master's thesis. A commitment for academic success at the Physics Department: the direct contact between professors and students. Foto: TUM/Heddergott. A mentor can help you in defining and putting together an individual study plan (e.g. when choosing the special courses). It makes sense to select the mentor from the research area you'll want to focus your studies in. Every student chooses her or his mentor within the professors and lecturers of the Physics Department – you can have a good overview from our website or from the info event about the current special courses, which is organized at the beginning of the academic year (i. e. only in the winter semester). You should choose your mentor during the first two weeks of studies and you have to hand in the certificate of mentor counseling, together with the registration of the Master's thesis (typically at the beginning of the third semester), in in the Dekanat. The form Certificate of mentor counseling (PDF) can be a guideline for the discussion with your mentor. You would like to support students as a mentor?